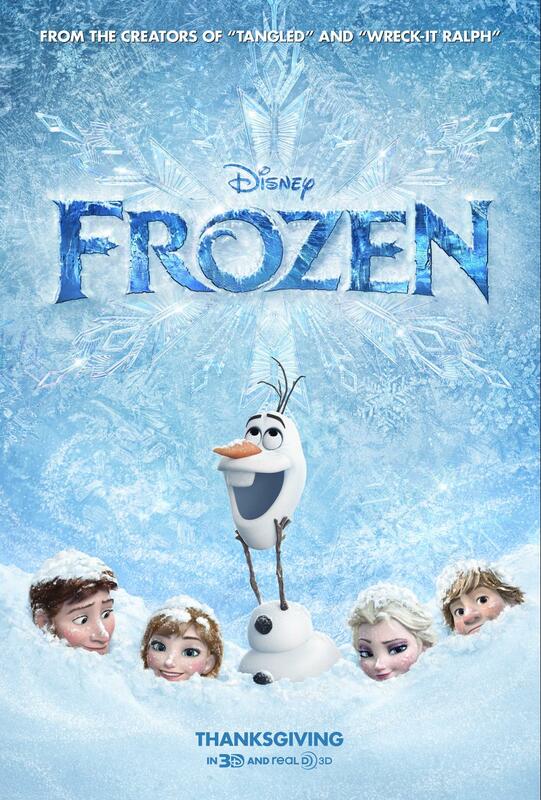 FROZEN is now playing in theatres everywhere! Walt Disney Animation Studios, the studio behind “Tangled” and “Wreck-It Ralph,” presents “Frozen,” a stunning big-screen comedy movie adventure. Fearless optimist Anna (voice of Kristen Bell) sets off on an epic journey—teaming up with rugged mountain man Kristoff (voice of Jonathan Groff) and his loyal reindeer Sven—to find her sister Elsa (voice of Idina Menzel), whose icy powers have trapped the kingdom of Arendelle in eternal winter. Encountering Everest-like conditions, mystical trolls and a hilarious snowman named Olaf (voice of Josh Gad), Anna and Kristoff battle the elements in a race to save the kingdom. The film is directed by Chris Buck (“Tarzan,” “Surf’s Up”) and Jennifer Lee (screenwriter, “Wreck-It Ralph”), who also wrote the screenplay. It is produced by Peter Del Vecho (“Winnie the Pooh,” “The Princess and the Frog”). Featuring original songs from Kristen Anderson-Lopez (“In Transit,” “Winnie the Pooh”) and Tony® winner Robert Lopez (“The Book of Mormon,” “Avenue Q”), and an original score by Christophe Beck (“The Muppets,” Oscar®-winning short “Paperman”), “Frozen” hits theaters in 3D on Nov. 27, 2013. In “Frozen,” fearless optimist Anna (voice of Kristen Bell) teams up with rugged mountain man Kristoff (voice of Jonathan Groff) and his loyal reindeer Sven in an epic journey, encountering Everest-like conditions, mystical trolls and a hilarious snowman named Olaf (voice of Josh Gad) in a race to find Anna’s sister Elsa (voice of Idina Menzel), whose icy powers have trapped the kingdom of Arendelle in eternal winter. Idina Menzel, who won a Tony Award® as best actress in a musical for her role as Elphaba in Broadway’s “Wicked” (2004), landed her first role on Broadway in 1995 in the Tony Award-winning musical “Rent.” Film credits include “Enchanted” and the feature film “Rent.” She has appeared in a recurring role on TV’s “Glee” and recently released “Idina Menzel Live: Barefoot at the Symphony,” a live concert with an orchestra led by composer/conductor Marvin Hamlisch. Menzel is currently on a North American concert tour. Jonathan Groff’s film credits include “Taking Woodstock,” “Twelve Thirty,” “The Conspirator” and “C.O.G.,” which was part of the 2013 Sundance Film Festival. TV credits include Fox’s “Glee,” the Starz series “Boss” and CBS’ “The Good Wife.” Groff received a Tony® nomination for his performance in the Tony®-winning musical “Spring Awakening,” and appeared in the Public Theater’s revival of “Hair” and off-Broadway plays “Prayer for My Enemy” and “The Submission,” among others. He made his West End debut in Ira Levin’s “Deathtrap,” and appeared in the 2010 Tony®-winning “Red” by John Logan at the Mark Taper Forum. Director Chris Buck helmed the 1999 Disney classic “Tarzan” (with Kevin Lima) as well as the 2007 Oscar®-nominated “Surf’s Up” (with Ash Brannon). His animation credits also include 1989’s “The Little Mermaid,” “The Rescuers Down Under” (1990) and “Pocahontas” (1995). Director/screenwriter Jennifer Lee is one of the screenplay writers of last year’s hit arcade-hopping comedy adventure “Wreck-It Ralph.” Her screen adaptation of John Steinbeck’s “The Acts of King Arthur and His Noble Knights” is being produced by Troika Pictures. She has an original screenplay in development with Leonardo DiCaprio’s Appian Way, and her original script “Lucid Dreams” was optioned by Wolfgang Peterson’s Radiant Productions. Walt Disney Animation Studios, the studio behind “Tangled” and “Wreck-It Ralph,” presents “Frozen,” a stunning big-screen comedy adventure. Fearless optimist Anna (voice of Kristen Bell) sets off on an epic journey—teaming up with rugged mountain man Kristoff (voice of Jonathan Groff) and his loyal reindeer Sven—to find her sister Elsa (voice of Idina Menzel), whose icy powers have trapped the kingdom of Arendelle in eternal winter. Encountering Everest-like conditions, mystical trolls and a hilarious snowman named Olaf (voice of Josh Gad), Anna and Kristoff battle the elements in a race to save the kingdom. The film is directed by Chris Buck (“Tarzan,” “Surf’s Up”) and Jennifer Lee (screenwriter, “Wreck-It Ralph”), who also wrote the screenplay. It is produced by Peter Del Vecho (“Winnie the Pooh,” “The Princess and the Frog”). Featuring original songs from Kristen Anderson-Lopez (“In Transit,” “Winnie the Pooh”) and Tony® winner Robert Lopez (“The Book of Mormon,” “Avenue Q”), and an original score by Christophe Beck (“The Muppets,” Oscar®-winning short “Paperman”), “Frozen” hits theaters in 3D on Nov. 27, 2013. For more information, check out Disney.com/Frozen, like us on Facebook: facebook.com/DisneyFrozen and follow us on Twitter: Twitter.com/DisneyAnimation. This is not a sponsored post, All information was received by ©Disney. for promotion courtesy.